PHOTO PROVIDED Brad Lubman conducts Musica Nova in a previous concert. The next Musica Nova concert, featuring visiting guest composer Charles Wuorinen, takes place on on Friday, November 16. 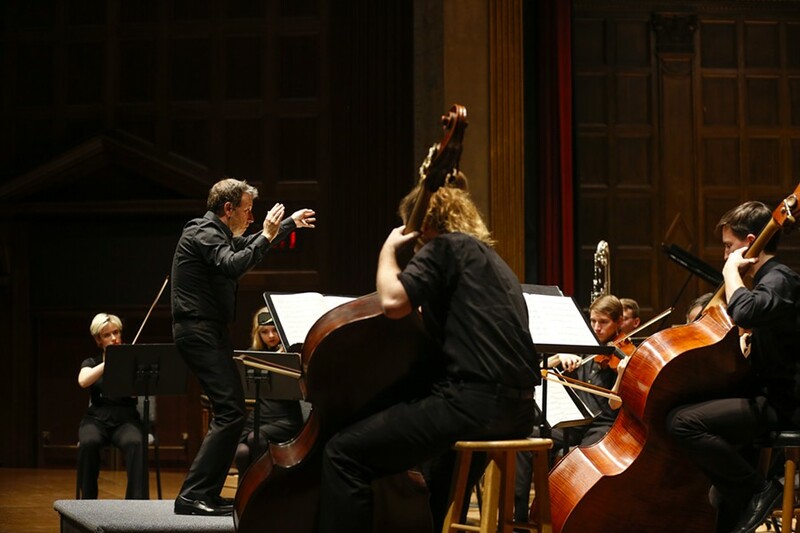 On Thursday at Kilbourn Hall, Musica Nova and its music director Brad Lubman presented an engaging concert of 20th- and 21st-century works with bold compositional personalities. Among them was the mercurial "Selene - Moon Chariot Rituals" by Augusta Read Thomas. For a piece with a title that suggests ethereal, lunar evocations, the music was decidedly visceral. With a versatile palette of colors ranging from metallic shimmers to woody strikes, the melodic percussion - including two vibraphones, one xylophone, and one marimba -possessed an intrinsic restlessness that drove the momentum. In contrast, the woodwinds' timbres were cool and detached. Lubman demonstrated a metronomic precision, but the decisiveness of his gestures didn't result in stilted rhythms. Instead, an element of magic seemed to permeate. Rebecca Saunders's "Into the Blue" was far more abstract, with a beginning that sounded like a forlorn battle cry: the stern double bass and resounding bass drum seemed to create a chasm of sound in which the dynamic cello could dominate, with tones that ranged from harsh and searing to beautiful and delicate. Rather than following a cohesive, tonal melody, the listener was left to the follow the varied textures of the instruments: among them, the airy ambience of the clarinet; the double bass's deep buzz; the darkly nasal quality of the bassoon. In a program populated with enigmatic compositions that bordered on mystical, including Anton Webern's Symphony, two works played in tribute to the late composer and conductor Oliver Knussen made the most impact. The first of this pair was Lubman's own piano piece, "Olly in memoriam." Feeling perpetually unresolved, Lubman's music had an inscrutable beauty that seemed to suggest that in death, the influential Knussen and his full depth are ultimately unknowable. The concert closed with Knussen's "Songs Without Voices," a series of vignettes that were atonal yet deeply lyrical. Rather than tell a specific story, these songs suggested an atmosphere. Knussen's lush orchestration featured tender strings, majestic French horn, and fluttering woodwinds - recognizable gestures of orchestral language. Oddly, however, the musical themes expressed in this language remained mysterious. One of the strongest Musica Nova programs in recent memory, the concert seemed tailor-made to entice listeners to return to these compositions on their own time. And isn't that the ultimate goal of a great concert?